Abigail Diaz, who graduated in 2014 with a double-major in History and Anthropology and a minor in Museum Studies, has been named one of CMU’s “10 Within 10” for 2018. Congratulations to CMU history professor Lane Demas for winning the North American Society for Sport History (NASSH) Book Award for best 2017 monograph in Sport History for his work Game of Privilege: An African American History of Golf! Game of Privilege was published by the University of Carolina Press in September 2017. The book received the 2017 Herbert Warren Wind Book Award. Congratulations to Andrew Dietzel on receiving the 2018 Gold CHSBS Excellence in Teaching Award! These awards recognize faculty members who go above and beyond what is expected in creating exceptional learning opportunities for our students. Established in 1987, the Herbert Warren Wind Book Award recognizes and honors outstanding contributions to golf literature while seeking to broaden the public’s interest in, and knowledge of, the game of golf. Wind, who died in 2005, was a renowned writer for The New Yorker and Sports Illustrated. He is the only writer to win the Bob Jones Award, the USGA’s highest honor. 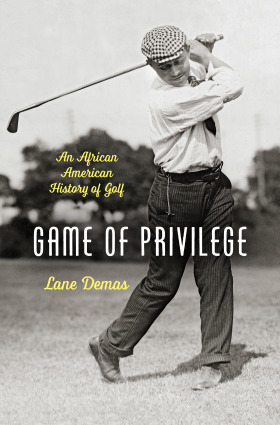 Game of Privilege: An African American History of Golf, authored by this year’s recipient, Dr. Lane Demas, is a groundbreaking exploration of the role of race, class and access to the game of golf. Dr. Demas details the history of black golfers during the age of segregation, the legal battle to integrate public golf courses, and the little-known history of the United Golfers Association, an all-black golf tour that operated from 1925 to 1975. Game of Privilege was published by the University of Carolina Press in September 2017.